We’re building a paperless office for real estate. It was said by Joel Andren, marketing chief for HelloSign, a digital signature firm that’s making a run at Docusign, the currently dominant player in the real estate world. Both firms enable real estate pros to have all parties in a transaction execute legally binding electronic signatures. So the pros can use services like HelloSign and Docusign directly. Or other software programs the pros might use could have HelloSign or Docusign integrated so it’s all seamless for the real estate pros using the software—and of course their clients who need to sign docs. I asked Andren what the difference was between his service and Docusign. His answer was “more nimble technology.” He said that Docusign is more like Microsoft Skydrive cloud storage, and HelloSign is more like a Dropbox type structure. So for example, if a realtor or lender was using Gmail, they could email a document to a client for signing, and the client would see a “Sign” button integrated with the rest of their normal Gmail buttons. The client would click that and it would be done. That’s a pretty damn good example of a paperless real estate industry. However, it will have to continue with realtors first, because most lenders don’t allow digital signatures. Andren contends that there are no legal grounds for banks to refuse digital signatures, and he’s right when he says that digital signatures are more verifiable than wet signatures. As a mortgage banker, I wish he was right. But lenders still require wet signatures on most docs in a loan process. So we’re not quite to a paperless industry yet, but it’s starting. And one interesting quantification of this process is Andren’s example of it costing about $40 per month to run a fax machine in your home—to pay for the phone line, toner, paper, and machine itself. His Hellosign service costs $15 per month. 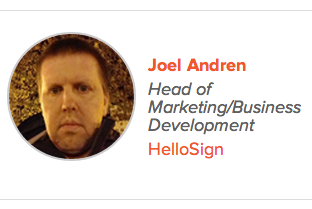 It’s also worth noting one other Hellosign vs. Docusign comparison. A company called Reesio chimed in at the conference to say that they’re just ending a contract with Docusign and will replace it with HelloSign. Reesio helps realtors manage transactions online by storing all documents and enabling all reviewing and signing of documents on screen. Reesio CEO Mark Thomas said his firm is replacing Docusign with Hellosign because of it’s “ultra easy API integration.” He said Hellosign is faster, ligher, easier to develop to and create custom user interface. Stay tuned to @thebasispoint, I’ve got a couple more posts coming from my RealTech conference blog series—more under radar startups plus more on on Trulia, Zillow and these two firms’ quieter competitor Move Inc.